For Info or Reservations, call us at 877-668-9637! Our unique mountain lake cabins allow you to get away from it all while still keeping you close to all of the activities in Gatlinburg and Pigeon Forge, TN. Our 2 bedroom cabins in the Smoky Mountains are rustic yet modern, offering all the amenities you would expect in luxury lodging such as fully-equipped kitchens with granite countertops, private hot tubs, mountain views and wooded settings. Walk out the door of your 2 bedroom Smoky Mountain cabin, enjoy a leisurely stroll to our beautiful mountain lake and gather around the outdoor firepit while you enjoy the sights and sounds of nature. Located on 135 wooded acres only 15 minutes from downtown Gatlinburg, TN, our 2 bedroom cabins in the Smoky Mountains are perfect for your family vacation. Browse our list of 2 bedroom cabins near Gatlinburg, TN below and plan your visit to the Smoky Mountains today! Unique mountain lake cabins located only 15 minutes from town but each one very private with hiking right outside the back door. Choose from studios, one bedrooms, two bedrooms for the best fit for you. Located on 135 acres of beautiful Smoky Mountain woods available for you to enjoy. Just a short walk down the country lane to the beautiful mountain lake located on the property. Rustic luxury, unbelievable setting with beauty and nature all around. Beautiful rushing creek runs across the property just a short walk from the lake. Truly away from it all and in the woods in Tennessee. NEWLY REMODELED 2015! Brand new plantation blinds installed throughout the cabins June 2016. Unique mountain lake cabins located only 15 minutes from town but each one very private with hiking right outside the back door. Choose from studios, one bedrooms, two bedrooms for the best fit for you. Located on 135 acres of beautiful Smoky Mountain woods available for you to enjoy. Just a short walk down the country lane to the beautiful mountain lake located on the property. Rustic log, unbelievable setting with beauty and nature all around. Beautiful rushing creek runs across the property just a short walk from the lake. Truly away from it all and in the woods in Tennessee. Several Stairs leading to front door on this particular cabin. Recently completely remodeled! Unique mountain lake cabins located only 15 minutes from town but each one very private with hiking right outside the back door. Some winter view! Choose from studios, one bedrooms, two bedrooms for the best fit for you. Located on 135 acres of beautiful Smoky Mountain woods available for you to enjoy. Just a short walk down the country lane to the beautiful mountain lake located on the property. Rustic luxury, unbelievable setting with beauty and nature all around. Beautiful rushing creek runs across the property just a short walk from the lake. Truly away from it all and in the woods in Tennessee. Great Mountain View! Completely remodeled May 2015! Unique mountain lake cabins located only 15 minutes from town but each one very private with off trail hiking right outside the back door. Choose from studios, one bedrooms, two bedrooms for the best fit for you. Located on 135 acres of beautiful Smoky Mountain woods available for you to enjoy. Just a short walk down the country lane to the beautiful mountain lake located on the property. Rustic yet modern, unbelievable setting with beauty and nature all around. Beautiful rushing creek runs across the property just a short walk from the lake. Truly away from it all and in the woods in Tennessee. Completely remodeled! Mountain View! Unique mountain lake cabins located only 15 minutes from town but each one very private with hiking right outside the back door. Choose from studios, one bedrooms, two bedrooms for the best fit for you. Located on 135 acres of beautiful Smoky Mountain woods available for you to enjoy. Just a short walk down the country lane to the beautiful mountain lake located on the property. Rustic and modern, unbelievable setting with beauty and nature all around. Beautiful rushing creek runs across the property just a short walk from the lake. Truly away from it all and in the woods in Tennessee. Call us! 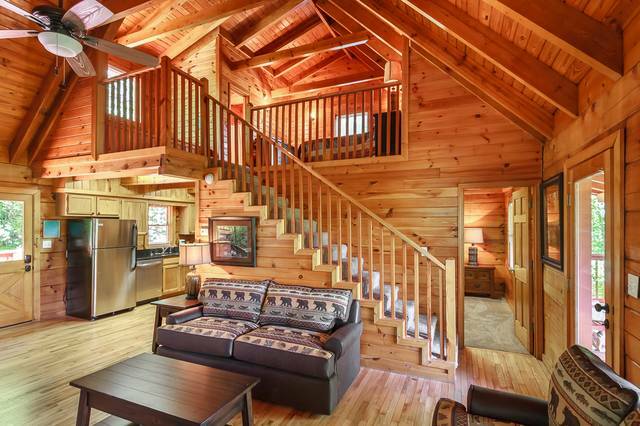 We’re here to help you find the perfect cabin for your Smoky Mountain vacation. Smoky Mountain Lake Resort © 2019. All rights reserved.